– Clean out your closets, cupboards, toy chests, shelves, attic, garage and basement. It is a good idea to discard anything you do not want or need. A rule of thumb is if you did not use something in the last year or two, chances are you do not really need it. Consider having a garage sale, gift unwanted items to friends and neighbors or donate them to charities. You may be able to collect a tax receipt on the value of your donation. – Arrange to collect any advance or security deposits on utilities or rentals. These could be a nice addition to your tight relocation budget. – Evaluate whether to ship your appliances and old furniture. Consider how old they are and how well they will fit into your new decor. Make sure you do not bring a gas stove into an electric home. Also, if your refrigerator, washer or dryer will not fit in your new home, consider leaving them behind. – Make a complete list of items to be moved. Decide which plants will come with you and which will stay behind. – Use up your food. Frozen foods can not be shipped safely. It is likewise unnecessary to carry a heavy load of canned or packaged foods with you. – Notify the security company and all other regular service providers such as lawn or snow removal companies of your moving date. – Notify your post office, subscription publications, and other correspondents of your moving date and provide them with your new address. – Check your homeowner’s insurance and make arrangements to renew your policy. You should contact an insurance company at your destination. – Check the status of your club memberships. The money you paid in advance may be refunded or you might consider transferring the membership to a friend. – Consult your veterinarian regarding your pet’s travel needs and make the necessary preparations. – Collect the items you lent to your friends such as books and CDs and give back all the items you borrowed. Do not forget to return library books and video rentals. – Research schools in your new neighborhood and register your children. Make arrangements to transfer all necessary school records. – Check your checking and savings accounts. Plan for transfer of deposits so you will not lose interest. If needed, your bank or Credit Union can be used as a credit reference. – Plan your moving date and take into consideration your travel plans and the closing date of your new home. -Plan your moving date and take into consideration your travel plans and the closing date of your new home. – Verify the date of your departure and contact the telephone, electric, gas and water companies to confirm the date to discontinue services. Notify your realtor or landlord. Make arrangements with utility companies at your new location to start services on the date of your arrival. Absence of vital utility service is very uncomfortable and often leads to unnecessary expenses for temporary accommodations and meals. – Discontinue newspaper delivery, sanitation and any other regular services. – Make sure to check fitness club, school or gymnasium lockers for stored belongings. – Ask your friends or your current doctors for referrals in the new location. Transfer medical records and get all necessary prescriptions. If any family members have ongoing medical or dental treatment programs, arrange for prorated payments with professionals in your new area. – Check the contents of your safety-deposit box. It is advisable to carry all valuables (such as jewelry, insurance policies, legal documents and important collections) with you or send them by insured or certified mail. – DO NOT SHIP combustible or flammable items such as oil-base paint, bleach, cleaning and lighting fluids, matches, ammunition and aerosol cans, including hair sprays, shaving creams, deodorants and household cleaners. 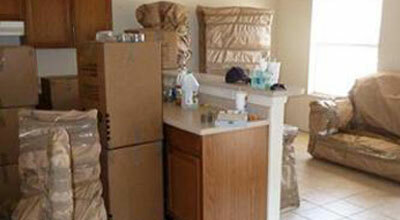 – If you ordered a packing crew, it will usually arrive the day before loading. Make sure to stay at home and supervise the packing. Pack all valuables you want to take with you by yourself. – Make sure fragile items receive special attention. Label each box with the contents and location in the new home. – Collect all house keys and arrange to leave them with the new owners, your real estate agent or landlord. You may want to notify the police if your home will be unoccupied for some time. – Notify a close friend or relative of your itinerary in case of an emergency. – Compare the mover’s inventory with your records and make sure you agree on the condition of your household goods. You may want to take photographs incase a dispute arises. Make sure you get a copy of the inventory list. – Give a last minute check to every room and closet before the van leaves. Make sure the water, furnace and air conditioner are shut off, windows are shut and locked, and the lights are switched off. – Check the Bill of Lading for accuracy and completeness before you sign it. Keep a copy for your records. – Make sure you have the van driver’s name and contact information, and give him contact numbers at the destination. Confirm directions to your new home with your driver. – Turn off the water heater. Set the thermostat at 15 degrees. – Be at your new home before the movers. You may be charged for waiting if you are late. – Contact utility companies to verify service start dates. – Check the appliances, furnace and hot-water heater. Contact a repair service if something is not working. 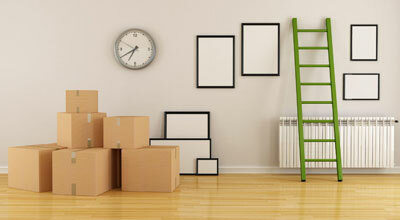 – Place a floor plan of your new home by the entrance, so the movers know where to place each piece of furniture. – Check the condition of each box or household item as it is unloaded. Make a list of all missing or damaged items on the mover’s copy of the inventory form. Since you will do most of the unpacking after the movers leave, it is a good idea to make a “subject to inspection for loss or concealed damage” note on the inventory form. By signing the inventory sheet, you are acknowledging receipt of all items listed. Personally report any loss or damage to your salesperson or move coordinator. – To prevent possible damage, television sets, other electronic equipment and major appliances should not be used before they have a chance to adjust to room temperature. – Call Canada Post to find out if they are holding any mail for you and ask the services to start. – Obtain necessary IDs such as driver’s license, health card, etc. – Register your car at the new address. Most provinces allow 90 days grace period. – Contact newspapers and other services for home delivery. – Walk in your neighborhood to get a good idea what is around and where to find things. – Check opening and closing hours of stores and service facilities. – Make friends with your neighbors. – Consult an attorney about any local laws that might be different from your previous residence. These will affect your family as soon as your new residence is established. This information is provided by Professional Moving Company Albert Moving!